UnitedSM Explorer Card Worth It? UnitedSM Explorer Card is not a card which is focused only on purchases on a company. You can also earn 2x rewards from many other travel goods with this card. It can be a good travel and flight card for you if you have a good credit score. Foreign transaction fee doesn't exist for this card. As we have always told, "this is very important for those who are travelling abroad." There are very good promotions and features of the card. Annual fee is quite good. You will not pay annual fee for the first year. This will make your bonuses more beneficial for consumers. 65000 miles bonus available in the card. 25% cash back available on some inflight purchases. See detailed information via clicking apply button below. Fees and interest rates of the card is high. If you have excellent credit score, minimum APR + bonuses + rewards can be beneficial for you though. 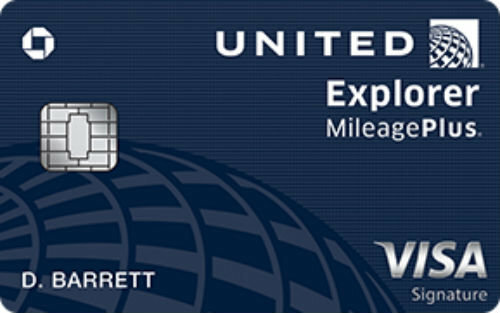 UnitedSM Explorer Card is a miles credit card that you can earn rewards through travelling through United Airlines. The card provide many benefits for consumers with reasonable annual fee and good sign-up bonuses. Besides the card is not only providing rewards on your purchases from the company. You will able to earn 2x miles with purchases other than United Airlines. Interest rates are a little bit high. However low annual fee and high bonuses are still considerable. Especially 2x miles for restaurants and hotels is making this card very attractive. 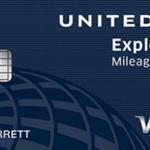 Additionally you are also going to earn 2x miles on tickets, economy plus, foods, beverages and wi-fi purchases in United Airlines. This is one of good miles credit cards of Chase certainly. You will also go on to earn 1x miles with all other purchases. You are going to get back 25 percent of your inflight purchases. Such as food, beverages and Wi-Fi. There is not also foreign transaction fees with the card which is very important for a travel/flight card. Additionally you will not pay the annual fee for the first year. This is making miles bonuses more beneficial for consumers. 17.99% – 24.99% 2x Miles on Restaurants and Hotels. 40000 Miles Bonus After $2000 purchase. 25000 Miles Bonus After $10000 purchase in 6 months. You can read some users reviews of UnitedSM Explorer Card below.